Celebrate New Year’s Eve with us. Live art and music. Raffle prizes. Limited tickets available. Call for reservations. What better way to ring in the new year than celebrating with friends at AJ’s On Main in Grapevine Texas. Don’t wait to call and get reservations. Limited tickets are available. The festivities start at 8pm with dinner, dancing and drinks. Chef AJ promises the food will be out of this world. 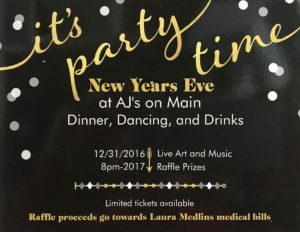 A raffle will be held with proceeds going towards Laura Medlin’s medical bills. Have a request or question? Use this short form to send us your request. Enter your address and get directions to our restaurant.